In my opinion Lagoona is the most beautiful doll. She is not my favourite character, but in doll form I find her to be the most beautiful. Somehow I see more in her than the good student and sportsghoul she is represented in the cartoons. She's so mysterious with these deep sea characteristics such as her fins, webs, pastel-coloured mermaid hair and pearly skin. I wanted to create an outfit for her that represents that hidden plus in her, this is how this ethereal composition came to life. I used wire to keep the forms in place. I hope you'll like it. Scarah and Billy are my favourite couple from the animated series. The clothes they are wearing have all been made by me, however, I felt that this photoshoot focuses more on the setting and the poses, this is why I decided to post it in the Darkroom. The romance between the telepath girl and the invisible man really sparks my interest! I am a 35-year-old woman who lives with her husband and half-year-old son in Hungary. I bought my first Monster High doll (Picture Day Spectra - Spectra is my favourite character) as a present for myself for my birthday last year. I stumbled upon the 3D movies by accident, and thise were what made me fall in love with the franchise. Before that the last time I showed an interest in either dolls or sewing was back when I was still a child. 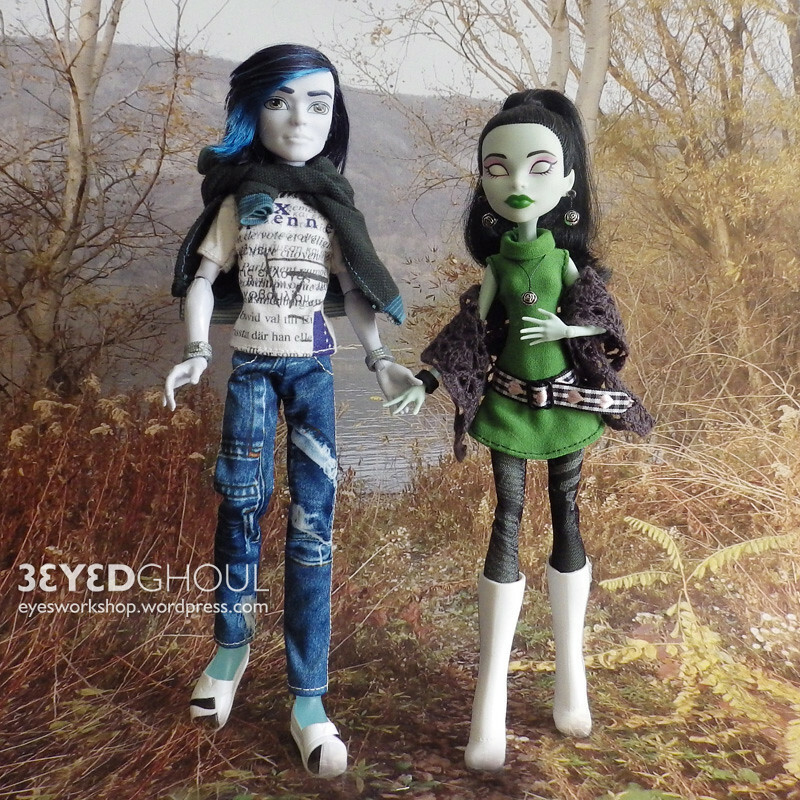 I did not have any professional qualification or experience in sewing when I started making clothes for my monster High dolls, however, I have since created numerous outfits for the many dolls I have collected. Last autumn I have started a blog to show off my new hobby, you can find a link to it in my signature. I am eager to try out repainting as well, but I haven't yet gathered the courage to do so. My husband has encouraged me to collect dolls. He has a passion for model trains, and he strongly believes that some kind of a hobby is needed in one's life I love creating clothes and accessories for my dolls, whenever I find some free time besides my son and housework (which is less than how much time I'd like ) I sit down and sew - almost every day. My collection currently consists of 71 MH, 2 EAH and 4 Bratzillaz dolls, and I also own a Simba newborn baby doll. There are several other dolls and doll lines that I like, however, whenever I have a chance to buy something somehow I always end up getting a MH doll instead My most recent love and wish is a MLP Eqestria Girl doll, we'll see when and if I'll get her. There is no real order in how I collect MH dolls, I just buy the dolls that I like. My original plan was to own at least one doll of each character, however, there are some dolls that I do not like at all (the hybrids, for example), so I don't think I will get any of those. I am really excited for the bigger MH dolls, and I'm sure I'll need giant Frankie once she will be available. In the webisodes and films my favourite characters are Spectra, Twyla, Scarah and Billy, and also Slo Mo, on the other hand, I really don't like Nefera. My all time favourite (both the film and the dolls) is Haunted. I'd like to collect all dolls from this line - so far I only own Kiyomi unfortunately. I also like ghost stories - like Stephen King's The Sining and Rose Red - in general.